CARLSBAD, Ca. (July 31, 2014) – St. Louis Blues forward Jaden Schwartz has always carried the heart, soul and spirit of his late sister, Mandi, with him on the ice. Further inspired by his older sister’s legacy, the 22-year-old Blues forward will now wear the number 17 that Mandi donned for the Yale University women’s hockey team. Coinciding with the jersey switch, which takes place in the upcoming 2014-15 NHL® season, Upper Deck has created two updated memorabilia pieces for the Schwartz family. The company used existing patches from the 2013-14 NHL® Upper Deck Series One Heroic Inspirations cards to create two blow-up versions that featured that actual memorabilia from Mandi’s game-worn Yale jersey. Embedded in the blow-up card are her Yale-logoed patch on the sweater for the Schwartz family, and another card featuring the No. 17 patch from her jersey for Jaden Schwartz. “I watched Mandi play hockey her entire life and I always noticed how hard she worked and how dedicated she was. She always wanted to get better and improve, I really looked up to her. I’m extremely excited to wear number 17 next year for her, it will be emotional but a special moment for me and my family,” Jaden Schwartz said. Upper Deck’s Heroic Inspiration cards featuring Mandi Schwartz were inserted into packs of 2013-14 NHL® Upper Deck Series One and can also be obtained through the Mandi Schwartz Foundation at www.mandi17.org/?page_id=197. 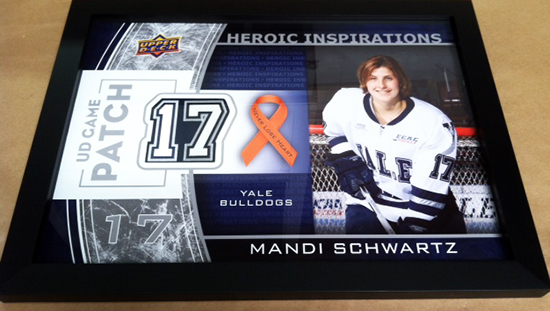 All proceeds of the sales of the Heroic Inspirations Mandi Schwartz hockey cards benefit the Mandi Schwartz Foundation. “Mandi was always a humble, hard working person who earned all of her achievements and accomplishments. She wasn't always the most talented, and maybe didn’t have the most skill but she was always the most dedicated and always went the extra mile. Mandi would be all smiles and it would make her day if she was able to see one of her hockey cards,” Jaden Schwartz said. Once a youth prospect for Canada’s national women’s hockey program, Mandi Schwartz was first diagnosed with acute myeloid leukemia as a junior at Yale in 2008 and she underwent chemotherapy and went into remission. She returned to school in January 2010 and was planning to play hockey again before relapsing. More treatments, including a stem cell transplant from umbilical-cord donors in Seattle helped, but the cancer remained. She passed away at home in Regina, Saskatchewan in April 2011 at the age of 23. Yale University has annually held a “White Out for Mandi” game and the entire St. Louis team was in attendance last year. She is still a prominent figure within the Yale women’s hockey program and her No. 17 still hangs in the women's team's dressing room. Not long after she passed away, the Mandi Schwartz Foundation was formed to help raise money and create awareness in order to help others in her name. “We are a family forever grateful to ALL the warriors in Mandi’s battle. And it’s Mandi’s battle and all her warriors that are represented in her inspirational hockey card – a beautiful masterpiece representing her legacy as a female Yale hockey player and her love of life and family and friends,” said Carol Schwartz, Mandi’s mother. ”Thank you, Upper Deck for the contribution to her legacy – our family cherishes this card. The Mandi Schwartz Foundation is a registered 501 (c) (3) organization that was founded by Mandi Schwartz’s family and friends as a way of continuing her legacy by helping others in her name. For more information on the Mandi Schwartz Foundation, please visit www.mandi17.org. Yale University comprises three major academic components: Yale College (the undergraduate program), the Graduate School of Arts and Sciences, and the professional schools. In addition, Yale encompasses a wide array of centers and programs, libraries, museums, and administrative support offices. Approximately 11,250 students attend Yale. For more information on Yale University, please visit www.yale.edu.